I am reading Krishna Udayasankar for the first time. I wanted to read her book because of my recent reading spree of literary fiction and various recommendations by friends. Maybe I am wrong in comparing it with the Shiva Trilogy. 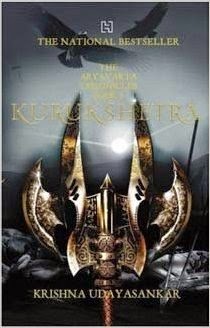 But to be frank, the book was way better than Kurukshetra. But then to be fair, maybe it would have been better if I had started from the first book. Most of us in India, have grown up reading or listening to stories form Ramayana or Mahabharata. Born in a country filled with stories, mythological stories, with takings from it. A story with multiple interpretations. Telling what our Dharma and Karma in the world is. The battle of Kurukshetra, a famed and important one. I felt the opening, as a boring and tedious one. The outline predictable to anyone who is familiar with the epic Mahabharata. The insult to Panchali that is Draupadi , the injustice, which is the main reason for the battle depicted very well. After a few pages, the book got me hooked. The last part of the trilogy starts off with the meetings in the background. The happenings around the states of Hastina and Matsya. With war in the air, roles of Govinda Shauri and Syoddhan. Gathering forces and support from other states which initially were supportive to Hastina and Syoddhan. But how Govinda rolls his dice and gets them in Dharma’s stride. She depicts very well the lives of unsung heroes like Shikandin, Dhrustadhymn, Hidimbya bringing second generation of many kings comes into light. Writing style of Krishna is interesting but tedious.There was more emphasis on the strategic actions and too descriptive. For a first timer like me, it took really a good time to get familiar with it and finish the book.The complexity is notable and one gets gets absorbed into the book only after a hundred pages. But what I loved was that the story emphasized on portraying all the ‘magic’ and ‘miracle’ with background of science and technology. So there is a reason behind the famous eclipse, reason behind the magical ‘astras’. So you don’t have to break your head about the book being unrealistic, because it is not. Shikhandin here,a character with less of feminine qualities, which I was amused reading.. Instead, he is a great warrior infusing great strength among the soldiers. Even the famous characters, Dron and Syoddhan takes him very seriously. Another character, Abhimanyu and his strong wife Uttara gets a deserving spotlight in the book, which I loved reading.From Abhimanyu’s role as pre-war strategic alliance, to his role as a lover beautifully told. Uttara, a strong feminine character. Krishna very nicely tells the tale which we don’t hear much in any other version, although we know, that Krishna is the one who actually fought the battle. Especially when most of the interpretation in Indian mythology is left for imagination and our own interpretation. Ashwattama gets a humble attention in the story. Most of the part is dedicated to the obvious 18 days long battle and the writer penned down the batlle picture perfectly with her words. The ending fabulous. Overall it was a good read. Could have been less tedious and descriptive.